Stephen Keshi has named a relatively unchanged lineup for the showdown with France which begins at 1700 hours Nigerian time. Following the unfortunate injury to Ukraine based Michael Babatunde, Liverpool winger Victor Moses has been drafted into the first eleven after he missed the last two matches against Bosnia - Herzegovina and Argentina. Nigeria number one Vincent Enyeama keeps his place in goal and will be protected by Efe Ambrose (Celtic), Joseph Yobo (Norwich City), Kenneth Omeruo (Boro) and Juwon Oshaniwa( MS Ashdod). Stephen Keshi has gone for Mikel Obi (Chelsea), Eddy Onazi (Lazio) and Peter Odemwingie (Stoke City ) in midfield. 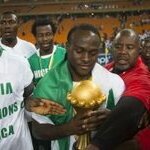 Fenerbahce striker Emmanuel Emenike, Ahmed Musa of CSKA Moscow and reinstated Moses will lead the charge for goals.